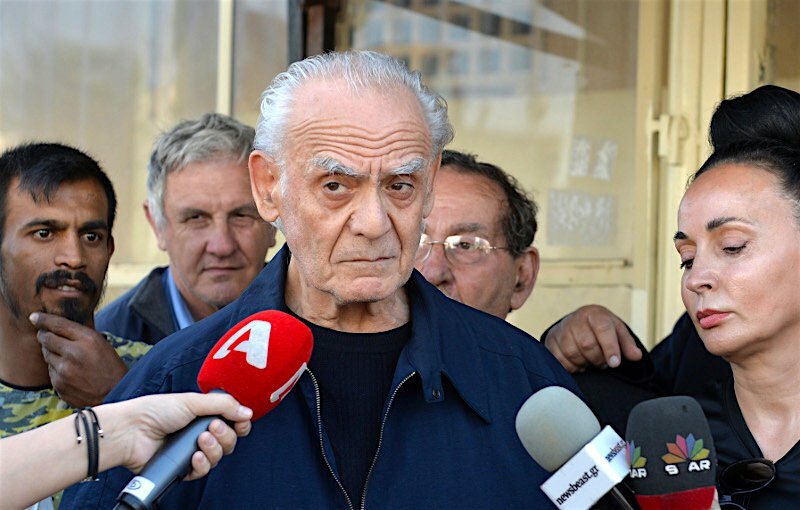 Former Defense Minister Akis Tsochatzopoulos was released from prison on Thursday afternoon on account of ill health. The former minister who was supposed to be released a day earlier but stayed in prison for one extra day due to red tape, paid a fine of 2,000 euros for a six-month sentence for undeclared assets and court fees. Last week, Tsochatzopoulos managed to collect 200,000 euros from friends and relatives to pay for his bail. His release on restrictive terms had been suggested earlier by the prosecutor’s office on account of excessive and irreparable damage to his health. Akis Tsochatzopoulos is one of the founding members of the Panhellenic Socialist Movement (PASOK). He has been a prominent party MP and served in several cabinet positions during the 1974-2007 period. In 1996, after the death of PASOK father Andreas Papandreou, he lost to Costas Simitis in becoming party leader. Chronologically, starting in 1981, Tsochatzopoulos has served as public works minister, minister next to the prime minister, labor minister, state minister, interior minister, public order minister, transport and communications minister, interior minister, national defense minister and development minister (2001-2004). In 2004 he married Vicky Stamati in a luxurious wedding in Paris that was widely publicized in the media. His lavish lifestyle and the exorbitant cost of his luxury home across the Acropolis along with the extravagant spending sprees of his wife led to investigations about his finances. Tsochatzopoulos served as defense minister in the 1996-2001. In 2010 authorities started investigations on his spending and the origin of his assets. He was accused of multi-millions in kickback scandals, such as the bribery case of the Ferrostaal submarine company. Overall he was accused of receiving exorbitant briberies in armament purchases for the Greek Armed Forces. He was also among the large number of Greek politicians who were bribed by German giant Siemens. On April 11, 2011, amidst scandal accusations, he was kicked out of PASOK. In May that year he was investigated by the financial crime unit (SDOE) of the Greek tax office. In January 2012 he was called by the prosecutor for declaring false assets. On April that year he was arrested for tax evasion and money laundering. He was found to have hidden millions in assets and money-laundering through three offshore companies.